As one of the largest and most successful independent media corporations in Europe, with a strong presence in the TV and digital market, including 14 free and pay TV channels and an online presence through web, mobile, smart TV, apps and social media, operating with integrity and in compliance with applicable laws is a top priority for ProSiebenSat.1 Tweet This!. 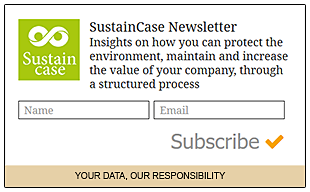 This case study is based on the 2016 Sustainability Report by ProSiebenSat.1 published on the Global Reporting Initiative Sustainability Disclosure Database that can be found at this link. Through all case studies we aim to demonstrate what CSR/ sustainability reporting done responsibly means. Essentially, it means: a) identifying a company’s most important impacts on the environment, economy and society, and b) measuring, managing and changing. In its 2016 Sustainability Report ProSiebenSat.1 identified a range of material issues, such as digitalisation and innovation, climate and environmental protection, public value, employees and diversity. Among these, promoting integrity and compliance stands out as a key material issue for ProSiebenSat.1. To identify and prioritise material issues ProSiebenSat.1 carried out internal workshops, surveyed people in positions of responsibility in various specialist departments and conducted a dialogue with individual interest groups. What actions were taken by ProSiebenSat.1 to promote integrity and compliance? As a result of the increasing digitalisation of its business operations, ProSiebenSat.1 pays special attention to data protection. Accordingly, ProSiebenSat.1 applies a risk analysis, including compliance review regarding the introduction/amendment of automatic procedures for processing personal data, according to Section 4f of the German Federal Data Protection Act (BDSG). This is to effectively address data-protection-law requirements at an early stage. Additionally, ProSiebenSat.1 implements a process for the legal notification of data protection incidences (unlawful access to personal data by third parties). The process follows Section 42a BDSG and Section 15a of the German Teleservices Act (TMG). 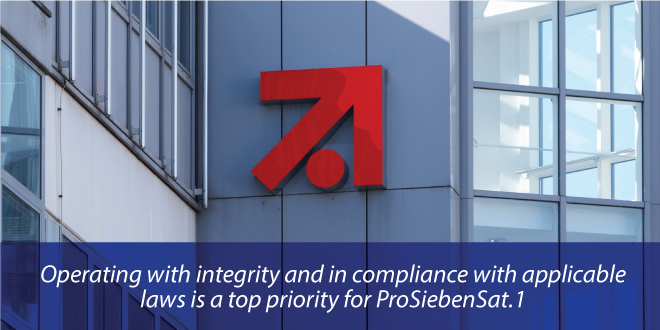 ProSiebenSat.1 applies a Code of Compliance, which includes fundamental guidelines and procedures regarding legal and ethical matters. The Code provides a framework for the Executive Board, the management and the company’s employees for dealing with each other and with business partners, customers, suppliers and other third parties. In addition, the Executive Board supports the Code of Compliance by providing appropriate compliance organisation, along with adequate and effective compliance programs that include consulting, training and measures derived from guidelines. ProSiebenSat.1 has established a Compliance Board. This Board supports the Executive Board in the implementation, monitoring and strengthening of ProSiebenSat.1’s Compliance Management System (CMS). The Compliance Board meets once a month. Its permanent members are the Chief Compliance Officer (CCO), the Chief Financial Officer (CFO), the Executive Board member responsible for Legal and Compliance and the Head of Group Audit. The Board is responsible for deciding on the focus of the CMS, investigating matters and proposing sanctions. Accordingly, the focal points of ProSiebenSat.1’s CMS are combating corruption, antitrust and media law, and data protection. Note to ProSiebenSat.1: With each case study we send out an email requesting a comment on this case study. If you have not received such an email please contact us.